In the last section, we have looked at an example of how a SAS macro variable can be used to write a dynamic SAS program. Before we continue, there is an important concept about macro variable that you need to know. This might come as a surprise. However the macro variable value is always a text string. Unlike a data step variable, macro variable does not distinguish between numeric or character. Any value, be it integer or text, are treated as text values. When you assign a value to a macro variable, SAS stores the value in what we called a symbol table. 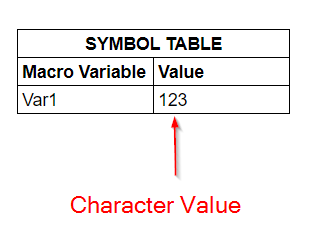 A symbol table is a table that stores the macro values. It only allows text to be stored. ​Let's look at an example. The %LET statement assigns the value 123 to the VAR1 variable. We cannot directly view the contents of the symbol table. If you want to know the exact value assigned to a macro variable, you can use the %PUT statement. The macro variable reference (i.e. &var1) will be replaced by the value assigned to the variable (i.e. 123). This tells us the value 123 is assigned to the macro variable var1. In data step, character values must be enclosed within quotations. For macro variable, the quotations are not needed. In this example, we assigned the value Tom Chung to the NAME macro variable. Although the quotations were not specified for the character value, SAS stores the entire text value in the macro variable called NAME. What if you enclose the text values within the quotation? If you do, the quotations will become part of the macro variable value. In this example, the text values are enclosed with the quotations. The SASHelp.cars data set contains a list of cars and their MSRP. Create a new macro variable called PRICE and assign the value 10000 to the variable. Create a Proc Print report for the SASHelp.cars data set and display only the cars with MSRP > 80000. The Proc Print report should make use of the macro variable PRICE defined in task 1.